Born 1966 in St. Petersburg. Graduated from St. Petersburg Conservatoire. Attended the international mastercourses and seminars in Darmstadt (Paul-Heinz Dittrich), Berlin (Mark Kopytman), Stuttgart (Helmut Lachenmann). In 1994-1996 was in the circle of Edisson Denissov, together with the latter wrote sound-track to the famous movie „The Tsar’s Hunt“. In 1995 was awarded the Grand-Prix at the UNESCO Competition in Paris (for „Frescoes of the Capella degli Scrovegni“). Chamber music of Igor Drukh was performed by the famous „Arditi“ and „Mozarteum“ String Quartets, ensembles „Musica Da Camera“ (Russia) and „Aleo“ (USA). Member of the Russian Composers‘ Association (since 1995) and „Brandenburg Collegium of Contemporary Music“ (Germany, since 1993). 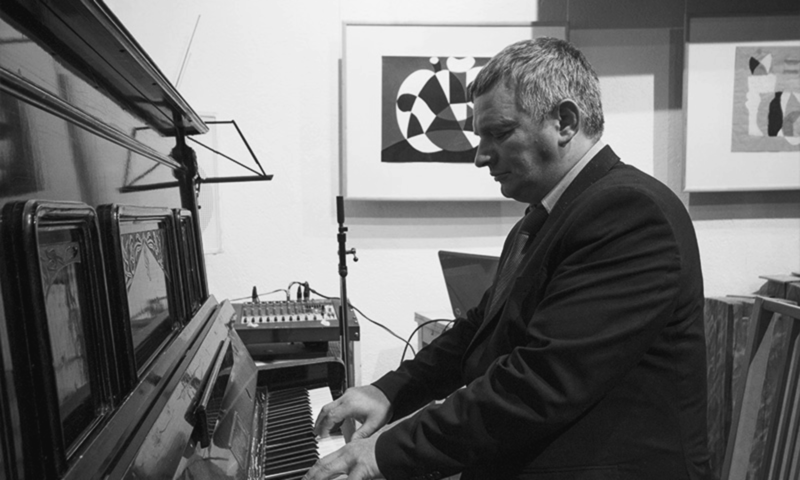 Music of Igor Drukh was performed at the various contemporary music festivals in Russia and abroad. Creative art of Igor Drukh combines the most refined achievements of contemporary European music with Russian church and traditional influences. The music of Igor Drukh has been frequently performed at the international festivals of modern music – in Poland, Lithuania, Austria, Holland, Germany, Russia. As a popular composer Igor Drukh frequently gets orders from various chamber music collectives and solists, among them are: „Alea“ group of Boston University, „Mozarteum“ string quartet from Saltsburg, „Arditty“ string quartet from Berlin, the Rimsky-Korsakov string quartet from St. Petersburg, „Musica da camera“ ensemble from St. Petersburg, „Modern“ trio from Moscow, and many others. Igor Drukh is prizewinner of many international copmposer competitions, as in France (UNESCO competition in Paris), in USA (Millenium Chamber Players in Chicago) and in Russia.